Author: Assibi Apatewon Amidu. Series edited by: Wilhelm J.G. Möhlig, Bernd Heine. 14 pp. Roman, 236 pp. It appears that grammar textbooks, social studies, and the like, are taking up the space left by profound grammatical studies into Kiswahili Bantu syntax and morphology and, as a result, the native speaker’s syntactic idioms and usage are increasingly consigned to the backwoods of Kiswahili language description and may soon be forgotten. Today there is great interest in Kiswahili literature, culture, sociolinguistics, social anthropology and other applied subjects like globalization and technology, to name a few, without a comparable interest in formal Kiswahili syntax and morphology that go beyond basic language skills. These developments would seem to indicate that students, scholars and researchers assume that everything there is to know about Kiswahili grammatical structure has already been described and exhausted. The data in this book reveal that such a conclusion is premature and hasty. The present study builds on earlier studies by the author and takes a closer look at complex nominal phrases (NPs) than was hitherto possible. 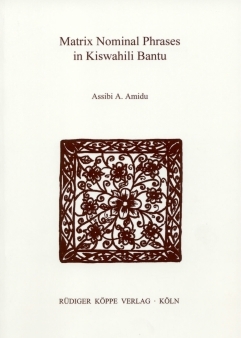 The book examines specifically the complex NPs of Kiswahili Bantu that function as matrix NPs. This is especially important because it appears that Swahilists, Bantuists and linguists tend to overlook the variety of NPs in Kiswahili Bantu in describing the languages of the world. Matrix NPs differ from ordinary NPs. The latter type normally has a single syntactic head, usually the external constituent or conjunct. The former type, however, has more than one agreeing head, and each behaves independently of the other in generating agreement markers. The book, therefore, highlights the complex functions of matrix NPs in Kiswahili Bantu and its implications for argument syntax. This should give Bantuists and Linguists an insight into the kinds of syntax that Kiswahili grammar has in its repertoire. Amidu has convincingly discussed complex paradoxies of matrix nominal phrases and agreement, and has succeeded in combining theory with wit.